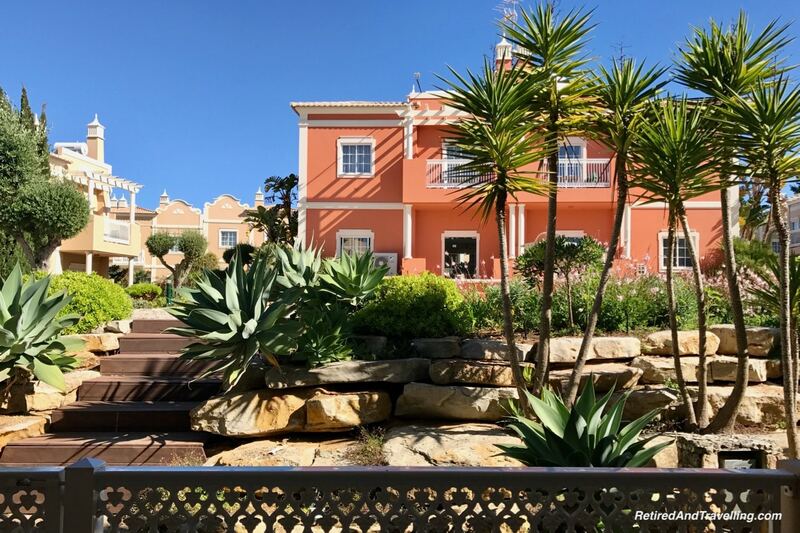 The first stop on our visit to the Algarve was high in the mountains in Monchique. This gave us a very different perspective of the Algarve from on high. 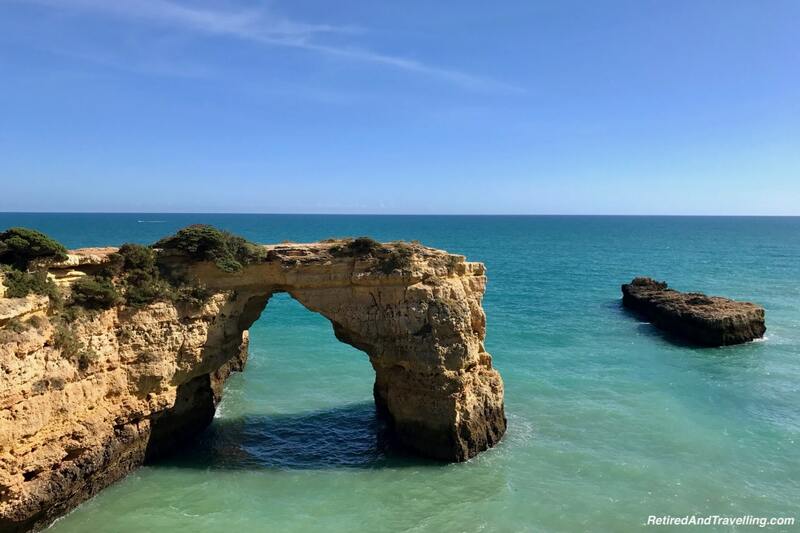 While it may have technically been our first view of the Algarve cliffs, we wanted to be much closer. After our weekend in the mountains, we wound our way back down to the shore. It was an interesting drive following my offline map app when we turned off the main EN125 regional road onto the small meandering street. After the last major turn we were on a narrow single lane road headed to the Algarve cliffs. We paid attention to the road signs and were prepared to pull over or back up if the other car had the right away. 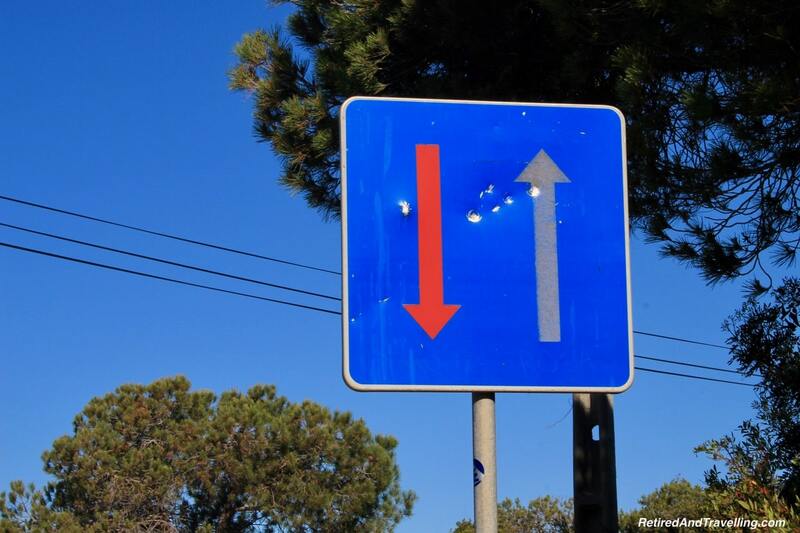 This was an early test of driving in Portugal. We finally came to a clearing and the sign for our resort. 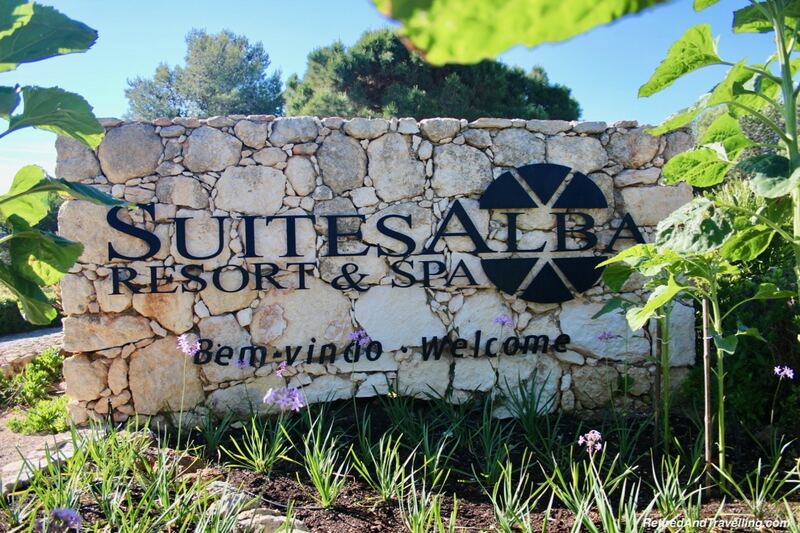 The Suites Alba Resort and Spa was a large complex of small buildings. After parking our car in a central parking lot we were taken for a tour of the property on a golf cart. 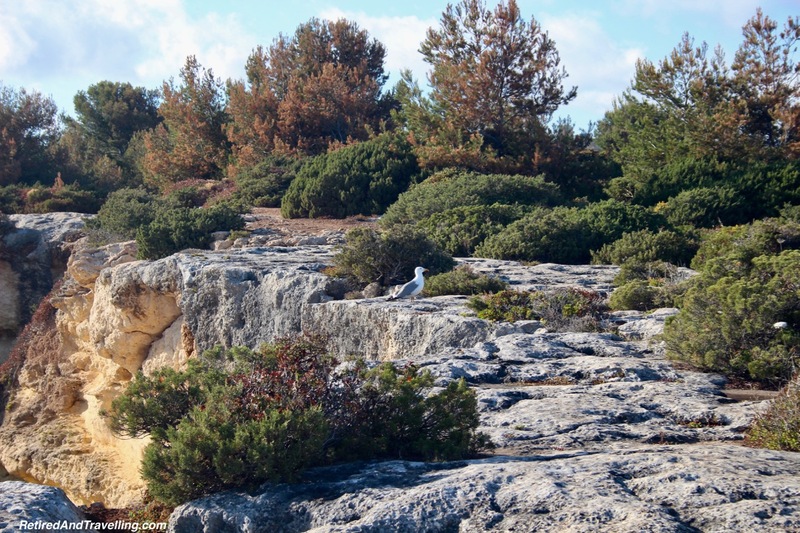 We were excited for our first view of the Algarve cliffs! 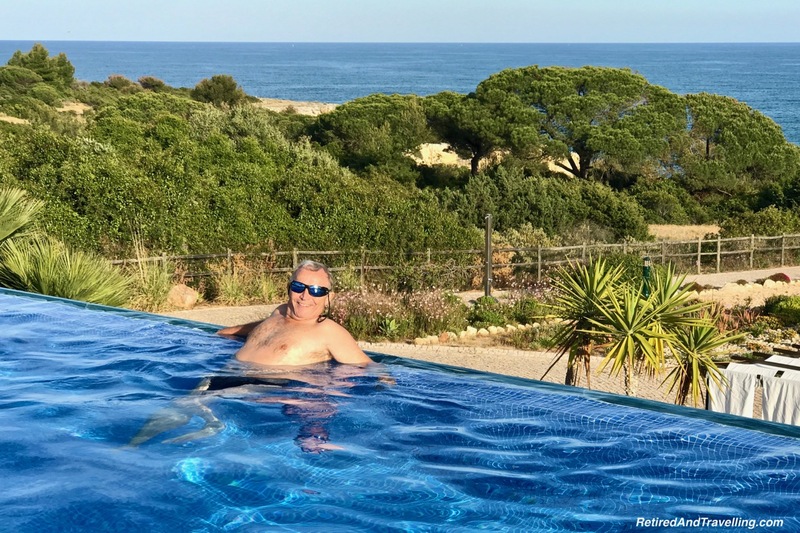 Staying in Monchique we had a view of the mountains with the sea far off in the distance. 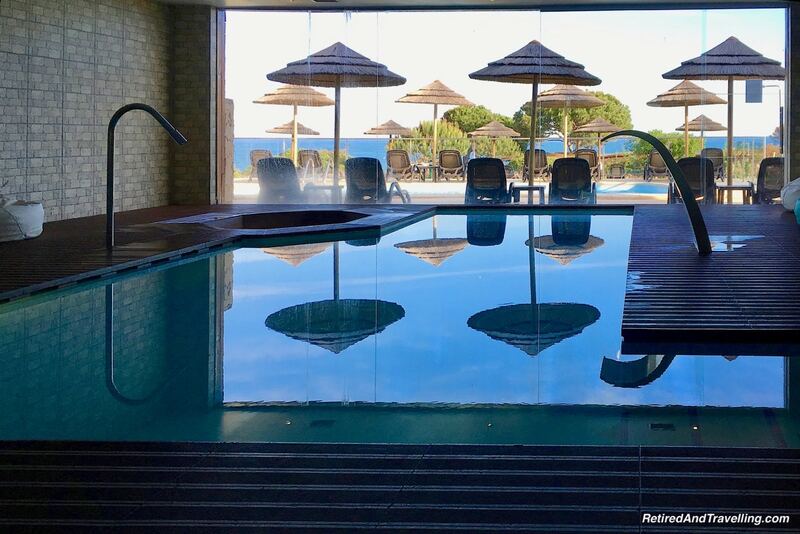 Our suite at this hotel gave us a view over the crystal blue waters of the Algarve. 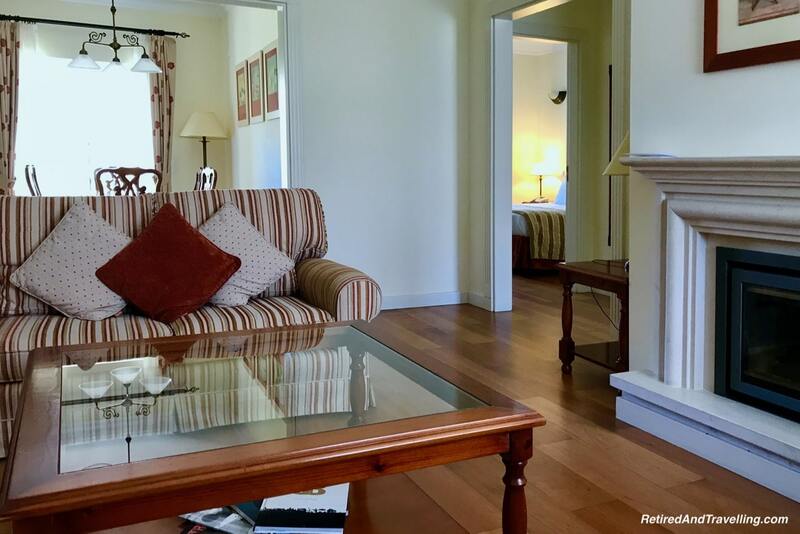 This hotel provided large suites with full kitchens, a living room and this one had two bedrooms. We could have hosted a party! As soon as we had dumped our bags, we went out to explore. The main part of the complex was quite close to our room. 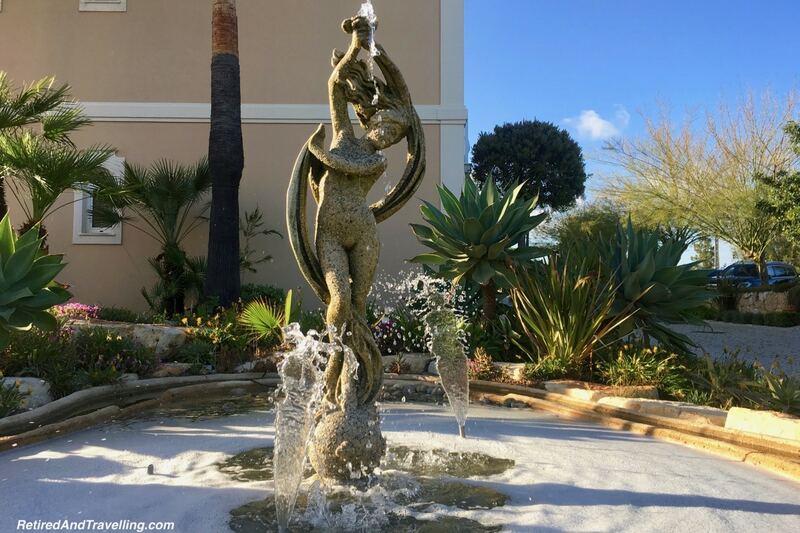 We didn’t worry about noise since this resort was almost empty! 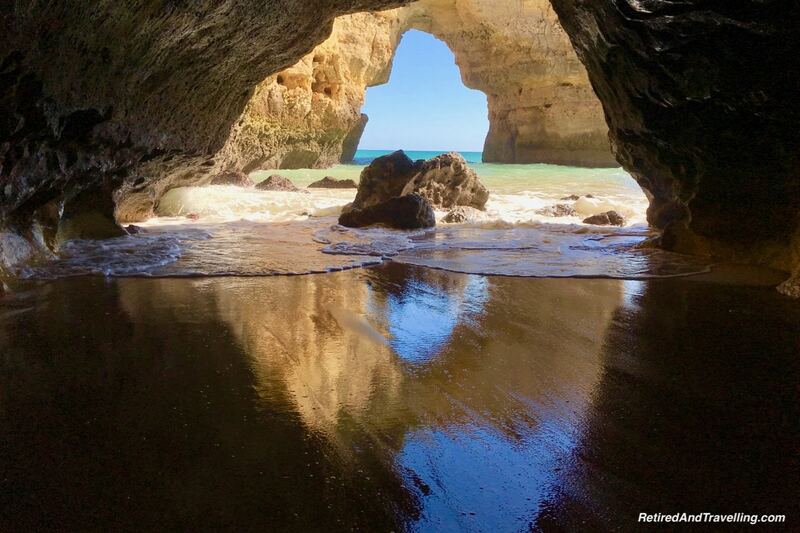 May was certainly a great time of year to visit the Algarve if you didn’t want crowds. The resort had a large endless pool right beside a children’s playground. We were happy to find a smaller pool that looked a little quieter. There was even a small spa pool inside. 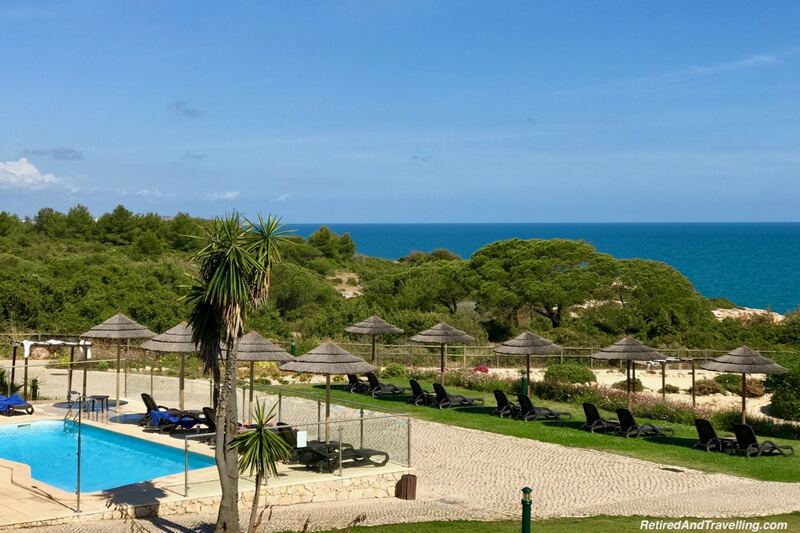 There would be no trouble finding a spot to relax with a view of the Algarve cliffs! 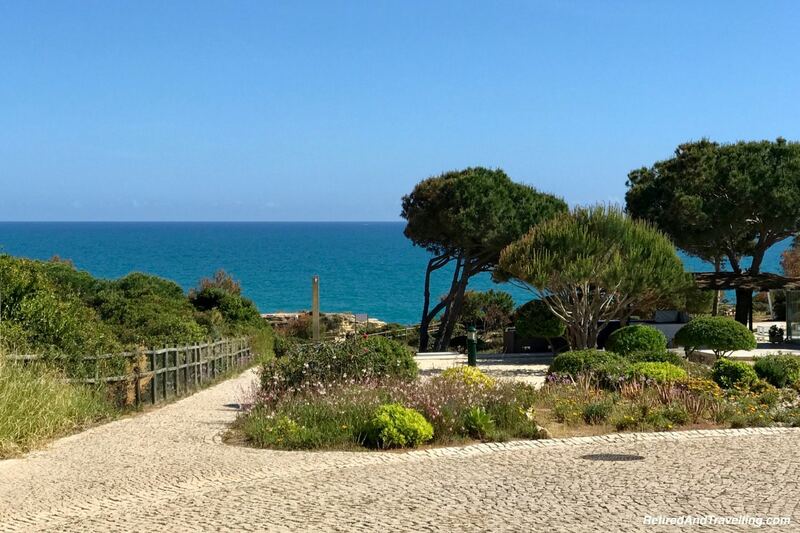 The resort was located high on the cliffs above Praia da Albandeira. 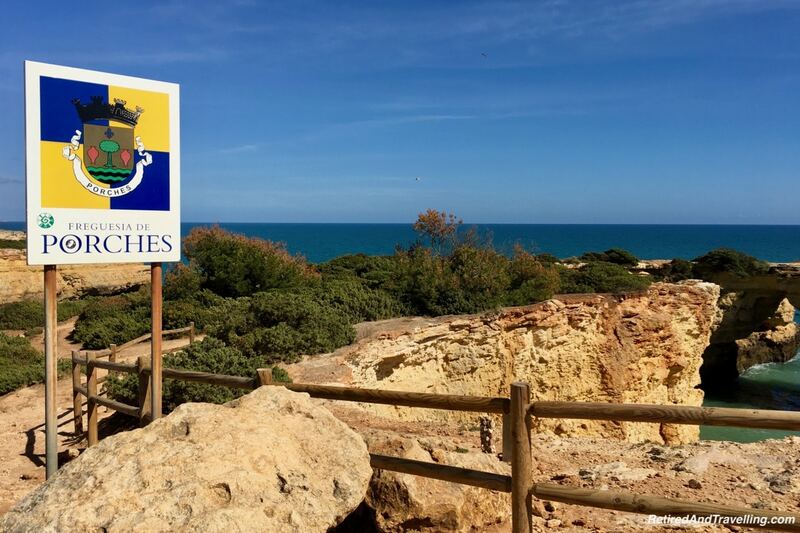 We followed the paths from the resort for our first view of the Algarve Cliffs. While I had seen lots of pictures of the cliffs, my mouth dropped open at the first view. 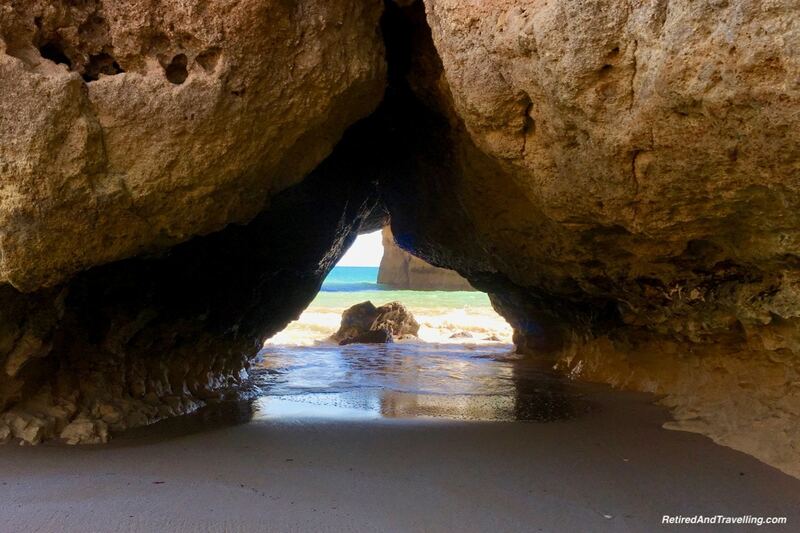 We wandered to catch different views of the rock arch and the cove below. There was a small rock outcropping sitting in the water. The water line was visible and we could see we were at low tide. 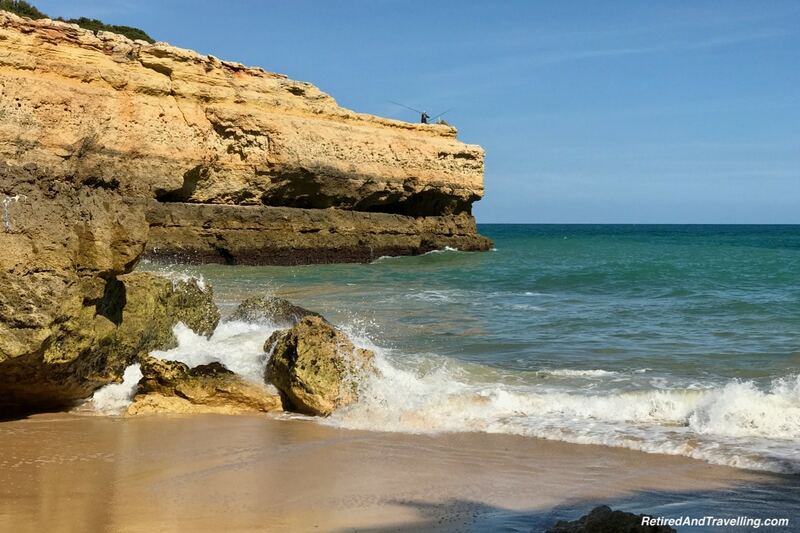 We wandered along the shore to capture our first images of the Algarve cliffs. 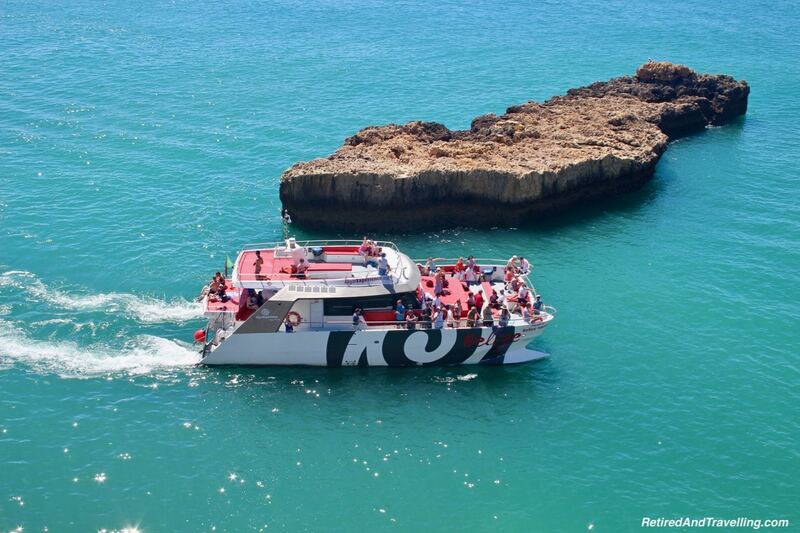 As we sat and watched the waves crash on the cliffs, we saw a number of different tour boats travel along the shore. Some stayed out. But the smaller ones actually came in to get a better view of the caves and cliffs along the side. It would be great to get a different perspective of the cliffs from below. We added that to the list for a next visit. One path led us to a view of Praia da Albandeira ( in Freguesia de Porches ) below the cliffs. We could see the sand beach nestled in the cover. We made our way down the path and headed to the beach. Since it was low tide, we could see a hole in the bottom of the cliff to the other side. It was marked with a danger sign but we figured that we could catch a view before the tide came back in. It was certainly worth the effort! 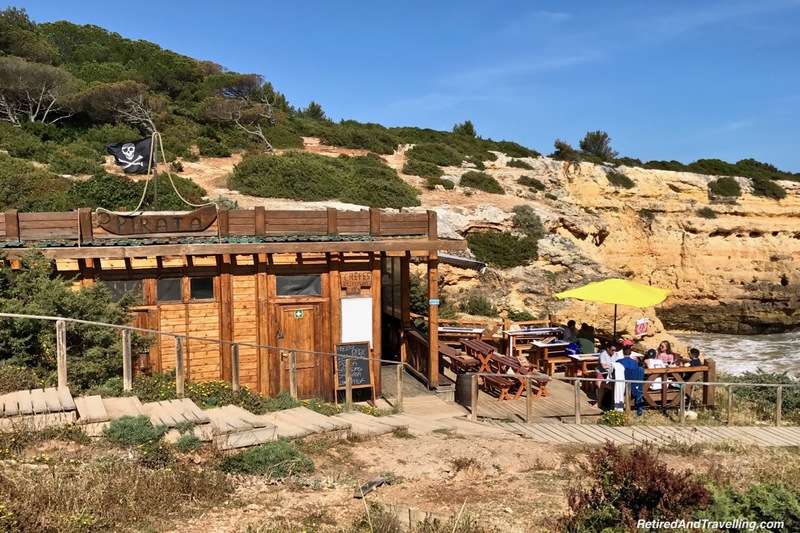 There was a small Bar O Pirata restaurant overlooking the beach. We settled in for something to eat. 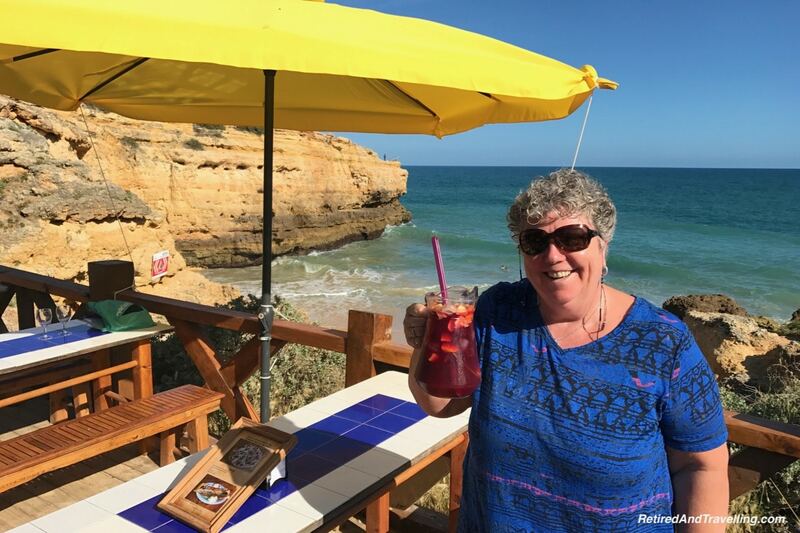 A pitcher of sangria helped us to enjoy the sunshine and the view. 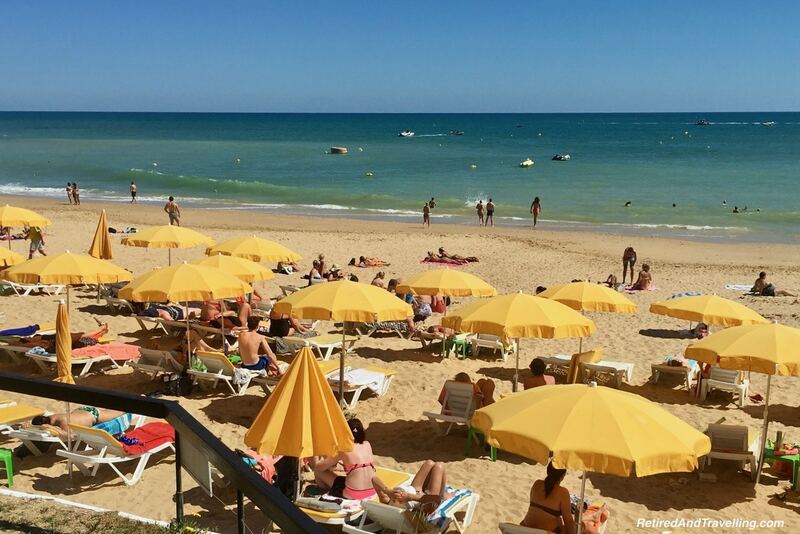 When we planned our stays in the Algarve, we intentionally stayed away from Albufeira. 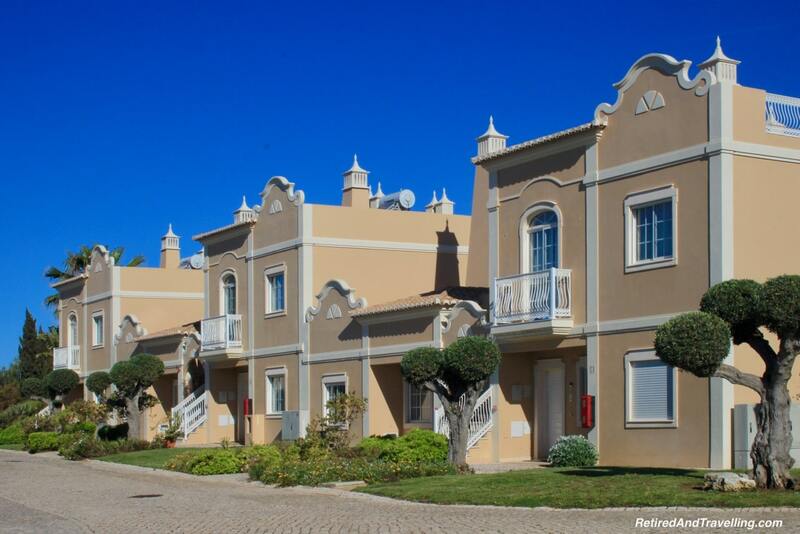 It looked like a large resort town much like you would find in many other parts of the world. We did not want a party place. 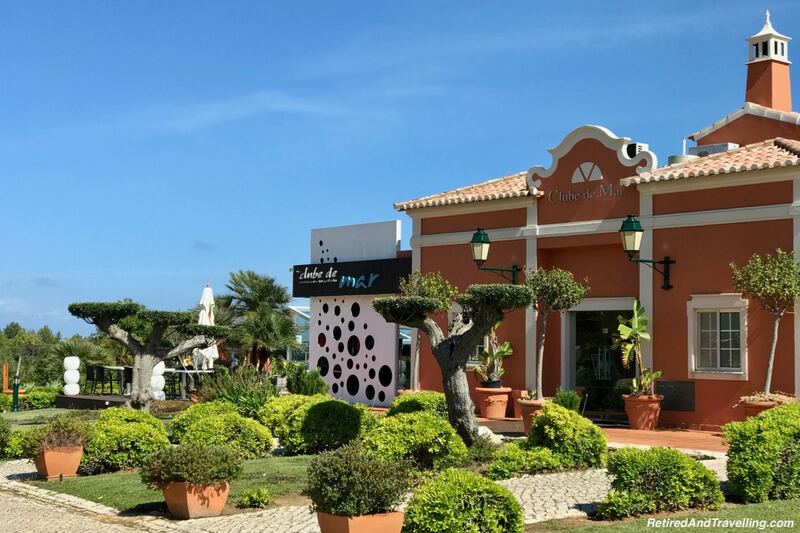 We have a friend who lives in Albufeira. For lunch one day, we met up with him and his wife. It was great to get a local’s perspective on his town. He had been born in the town when it was still mostly farm land and had seen the growth through the 1960’s and 1970’s. He drove us up and down the roads pointing out key things of interest. We had lunch at a local spot that he recommended. We knew he was a regular by how many times he got pulled into a conversation. His recommendation for grilled tuna with bananas was delicious. He made sure we left with two bottles of local wine. One was a very unique green wine. A quick look at the town and the beach reinforced our decision not to have stayed in this town. 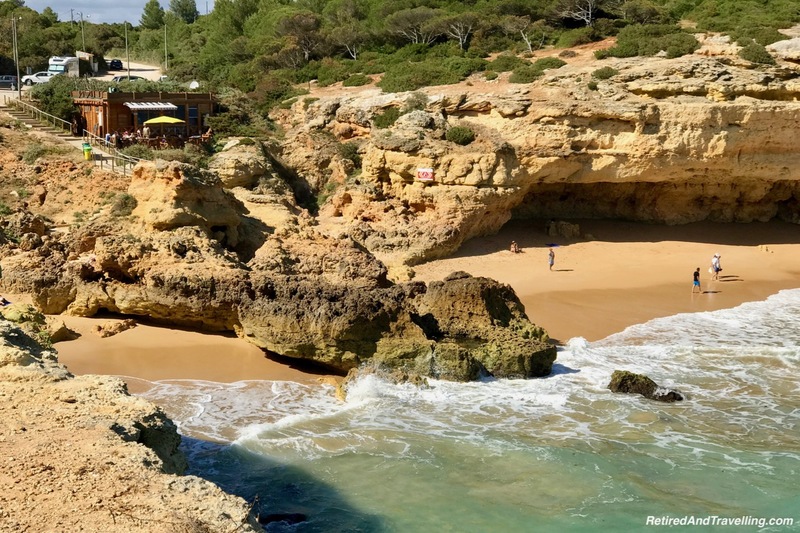 While it had a great flat sand beach, it could not match our first view of the Algarve cliffs! 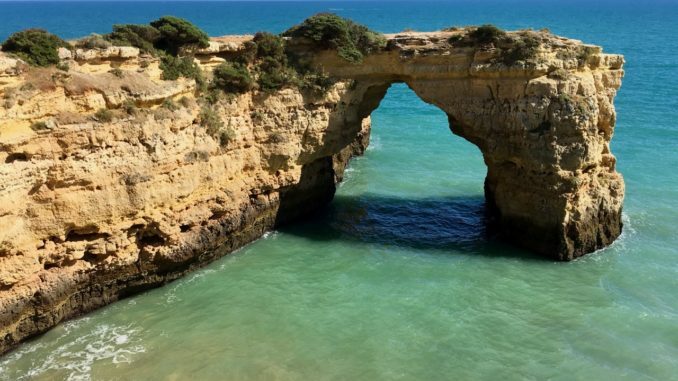 We had 3 days to enjoy this stop by the stunning cliffs of the Algarve. It captured our hearts on the first view. 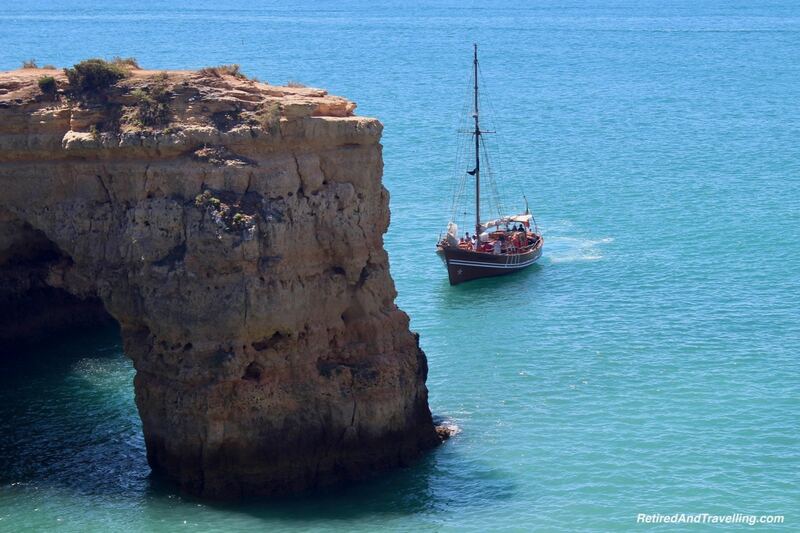 We would see many cliffs as we day tripped around the Algarve. 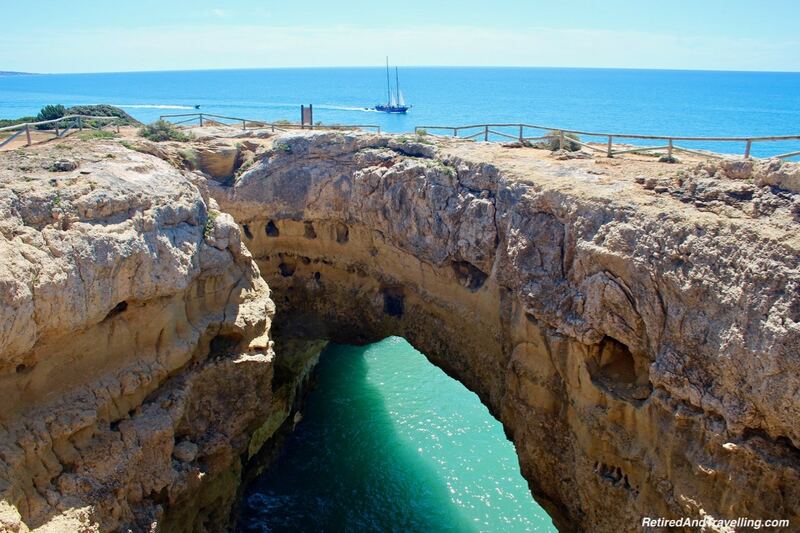 But this first view of the Algarve Cliffs would remain in our memories. This was a central location and great for taking a day trip to the western Atlantic shore. 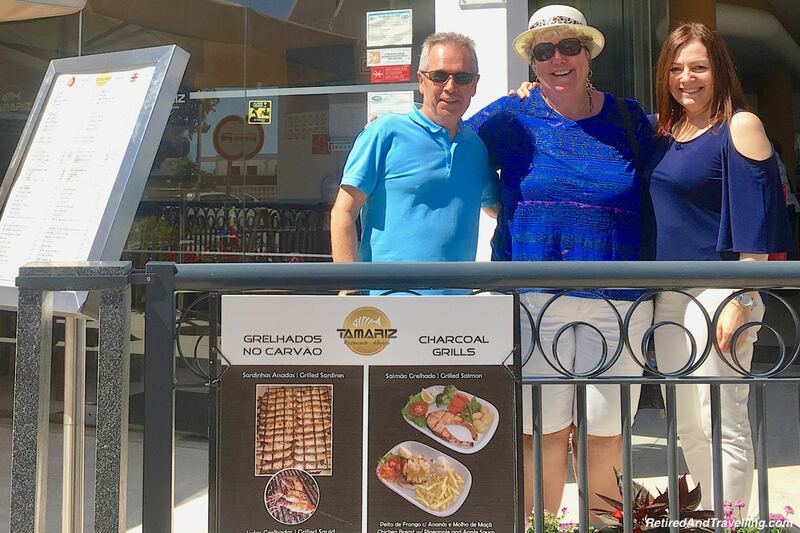 Albufeira was close if we wanted a little more excitement. 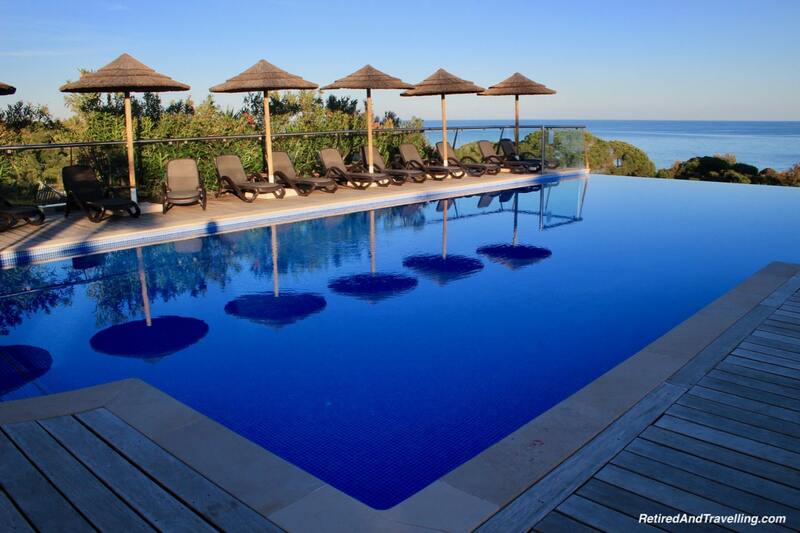 But we would have been content to stay here for a few weeks and really relax to the sound and sights of the Algarve. 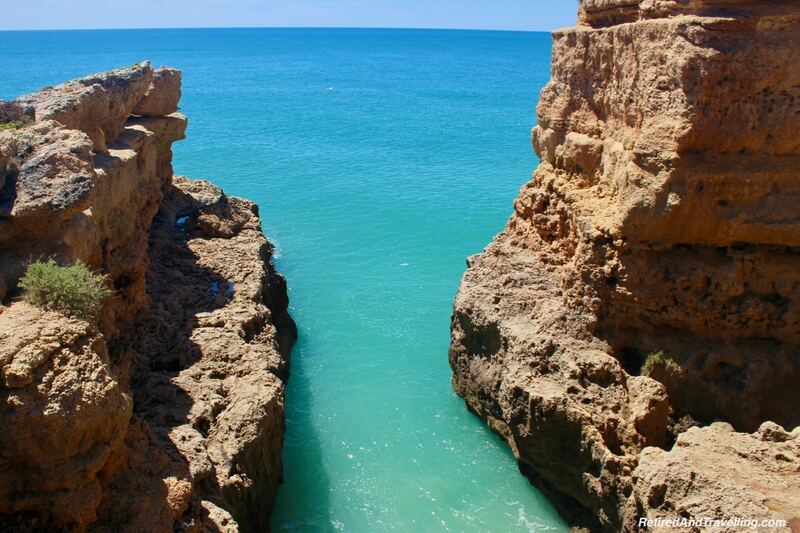 Do you remember your first view of the Algarve cliffs? Were they as stunning as you expected?